I started gun deer hunting in Wisconsin at age twelve in 1984. It was the most exciting time of the year. I looked forward to the oncoming season much like that of the coming of Christmas morning in my earlier years. As the seasons passed and I grew older, my excitement and anticipation dwindled even though this was during the years of population booms and successful hunts. The enthusiasm faded for gun hunting but returned as I became enamored with bowhunting. I enjoyed the tranquility of the woods and the skills and patience needed to kill a buck. The thought of heading to central Wisconsin for the opening weekend barrage of bullets and heading back Sunday night no longer held as much appeal. 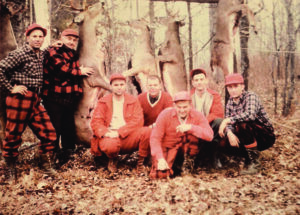 In the early 90’s, I was invited by a longtime friend and hunting partner to try my hand at gun hunting deer in the big woods of Northern Wisconsin. By big woods I mean the vast areas of National County and paper company forest lands that stretch for miles where deer very rarely see the sight of human presence. It was this first experience in the Northwoods that rekindled that youthful enthusiasm once again. 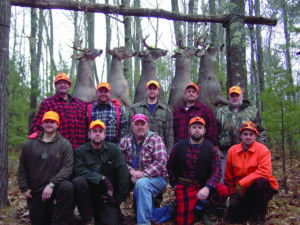 Up North the tradition of deer camp is alive and well and it really is the best time of the year. In our deer camp, we have a group of guys that span many generations. Some of these guys have been running these same ridges and cedar swamps since the 30’s. While the camp has changed over the years and a few improvements have been made, the basics are still the same. The hand pump for water is gone to make way for the comfort of running water and an inside toilet. The one hole’r is still out back but just a back up for the morning rush. We don’t use tree stands or ground blinds. We don’t dump massive piles of bait. I’m not disparaging these as non-effective methods or criticizing these ways, we just don’t do it. We prefer to hunt the “Old Way.” Deer hunting is still a one on one affair. Still-hunting and tracking is our method of choice. Oh and one other, wool still hasn’t been replaced by that Gortex stuff. In the North, every day is like opening day. The extra bonus is that you have nine of them. You never know what the day is going to bring when you are still-hunting. It could be the day for the buck of your dreams or the woods may seem like the most desolate place you have ever been. Over the last few years, we have noticed our deer sightings have remained consistent while others in our area that are tree sitters are not seeing the deer. We have several theories for this. First, the populations are obviously down in the Northwoods due to over harvest and the rise in predators. We feel deer are moving even less during the daylight hours, holding tight until they absolutely have to move. When a feeding pack of wolves moves through an area, deer move out for several days. It’s usually a good bet to not waste your time hunting in an area when you cut a fresh set of wolf tracks. Usually, a plan will be formulated the night before we head out hunting. The study of the topographic maps, deer sighting, fresh sign and weather forecasting all go into devising the following day’s strategy. Daybreak finds us at the areas that we plan to hunt. Some days an excess of ten miles may be covered and others as little as one or two. The basic approach is to quietly sneak through feeding and bedding areas in hopes to catch up to a buck, sighting him before he is alerted. The rule here is simple, quiet, every move is calculated and done smoothly; all the while scanning up ahead for deer and your next step. At times you may come across an area that deserves a little stop to stand for a while. This is especially true if you run into a feeding doe, waiting to watch her backtrack will sometimes yield a trailing buck. An overnight snowstorm brings even more excitement to the morning. After the storm the deer will be on the move feeding. This is an excellent time to cut a fresh set of buck tracks that adds a whole new element to the hunt. 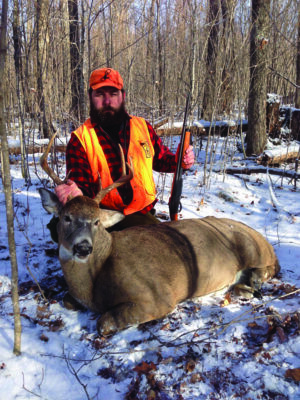 Trailing a big buck can be rewarding and frustrating but always an all-around learning experience. With this method you either get ‘em or you don’t, but he may help you learn his tendencies when he is pressured or just on his daily routine. The more experience and time spent applying this method to your area will help with success. You will soon learn that the big bucks utilize the same travel and escape routes year after year. These are key areas to remember, especially when hunting with others in your group. Many times if there are a few working an area remembering these corridors will lead to catching a buck trying to sneak out from one of your hunting partners. Usually, they are close and always willing to help you drag out your buck. Just as important as keen woodsmanship skills, the right gear is essential and some tools could save your life. We opt for pump and lever action rifles. Varying from iron sights to low-powered scopes. The idea here is quick sighting and close shots. Previously stated, wool is the clothing of choice. Layering your clothing is also key to staying warm and comfortable. Cotton fabrics are better for wearing around camp. The reason is they hold moisture and will chill you when you stop moving. A compass is a must, even if you have a GPS. Other important must takes; lighter, topographic map, knife, flashlight, high energy snacks, a canteen and extra gloves. I prefer to hunt with a vest that has multiple pockets and pack space on your back that comes in handy for shedding a layer or two as the day warms up. Remember, you are going to be covering miles and you don’t want to carry too much extra weight. On that note, the hunt could turn into an endurance test. That big buck lives there every day and can cover two miles before you even figure out which way his tracks are going. The better shape you are in when you arrive in deer camp the better. You may need to cover some ground if you are on a hot track. Also, at the end of that track, if you are successful, you still have to get him out and chances are you will be pretty far from the vehicle. This style of hunting may not be for everyone nor is it possible to do in all areas. But this is what I look forward to every fall. Success here isn’t measured in what is hanging on the pole but by the experience itself. 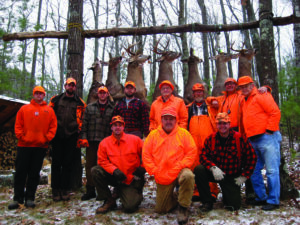 Nine days of chasing whitetails from a traditional deer camp with a great bunch of guys. Now this is living! If you need better hunting gloves then read this on the gear hunt.